Leisel is our oldest ewe, born 2009. She had two or three sets of triplets before coming to our farm. Has leader sheep genetics and is the most wary and alert of our sheep. She is an independent thinker. Excellent mothering abilities. She is creamy white and carries both spotted and brown. Quizzy is our most friendly ewe and pushes her way to the front for treats. She has no fear of dogs and runs them off when they get too close to her lambs. She is grey, becoming lighter with age. Carries black, brown, and spotted. Ebony is our biggest ewe. Delivered triplets in 2016. She is a striking solid black and carries brown and spotted as well. Very nice fleece. Kono is friendly, confident, inquisitive. Sire Draco. She is black mouflon. Carries brown and spotted. Leger is a grey moorit who lost a premature singleton her first year, but in 2017 had a nice set of twins and has taken good care of them. Sire Draco. Carmela, a moorit mouflon, is named for the rich caramel color of her outer wool. Sire Draco. Self-assured and friendly. Twin sister to Kono. Carries spotted. Probably our second biggest ewe. 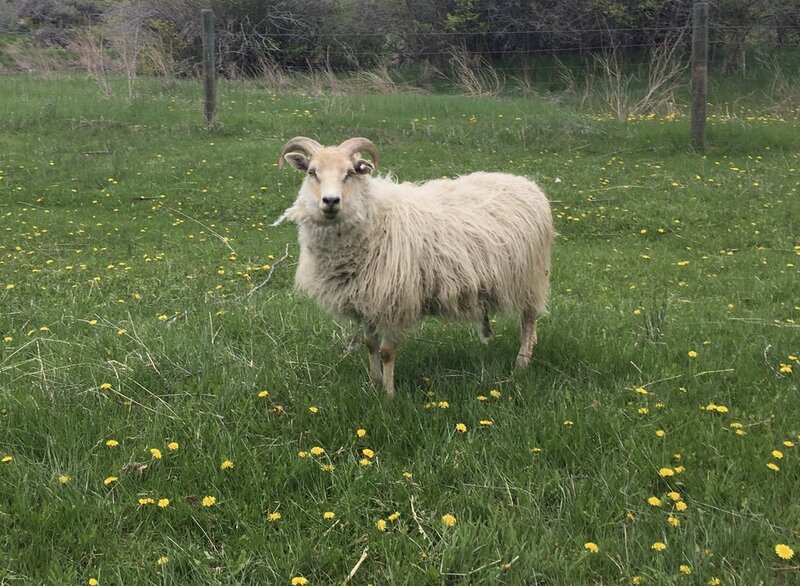 Mani is out of my aunt's flock in western Colorado (Lingerfold). He is white and carries genes for black, brown, and spotted. Friendly, easy to shear. Good horns. Black Jack is solid black mouflon. Carries brown and spotted. Dam Ebony, sire Draco. Our biggest ram and friendly like Mani. He is now the strongest and most dominant ram.